Along with Pavement, Seam, Rodan, and Archers of Loaf, Polvo pushed me further and deeper into indie rock obsession during high school. Naturally, all of them broke up before I moved off to college, thereby preventing me from the hit-or-miss experience of a vintage Polvo show, but their current reunion / reformation finally rectified that situation. There’s something about their music that seems particularly tantalizing in a reunion context, since they were too fidgety and strange as a band to trot out the greatest hits and leave it at that (see: Pixies). Not that they don’t have greatest hits—“Feather of Forgiveness,” “Vibracobra,” “Can I Ride,” “Every Holy Shroud,” “Gemini Cusp,” “Tilebreaker” and a number of others immediately come to mind—but I had no idea what they’d actually play and even less of an idea of how they’d play it. New Radiant Storm King (photos here) seemed like an appropriate opening act, since I mainly know of them courtesy of a split single they did with Polvo back in 1994. This show was the first time I’d actually heard them, however. Their genial banter was a good fit for their 1990s-styled indie rock, although in a strange twist the songs from their next record sounded better than their older material. I’ll check out that record whenever it comes out and catch them again the next time they play Boston. Birds of Avalon blended drifting psych-rock and cocksure 1970s hard rock with promising results as the middle act. Some of the psychedelic aspects felt too aimless, like they simply ran out of meaty riffs to fill the songs, but I can see them putting together a cohesive show and/or album in the future. Each guitarist sang one new song, with Dave Brylawski’s contribution sounding like a restrained version of one of his Shapes tracks and Ash Bowie’s recalling more of the Exploded Drawing era, and I think there might’ve been a new instrumental track. Given the proliferation of new material within the old songs, like an alien bridge section of “Every Holy Shroud,” it’s hard to tell where truly new material started and where improvisation of old material ended. The set list also included “D.D.S.R.,” “Bombs That Fall from Her Eyes,” “Thermal Treasure,” “Title Track,” and “Feather of Forgiveness,” but nothing from Cor Crane Secret. It’s unclear whether they’ll record a new album this year, but this reformation should certainly be filed alongside Mission of Burma and Dinosaur Jr. in the worthwhile category. I’m rarely as afraid of my peers that a reunion will soil a band’s legacy, since I’m not all that concerned about critical legacies affecting my personal enjoyment of a group, but I was surprised that seeing Polvo reformed made me appreciate them more. 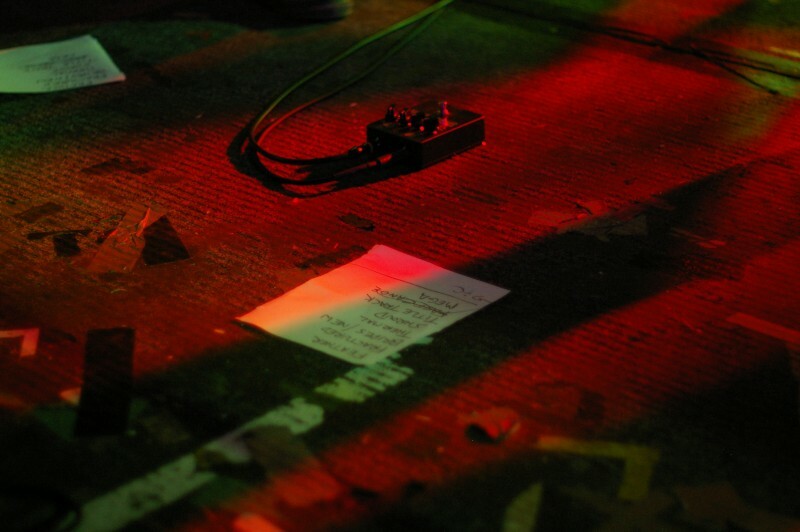 * Side note: After I took a picture of a distant set list so I could zoom in and read the titles more easily before they started playing, the guy behind me asked if I could read the list. After I started relaying song titles, he decided he didn’t want to know, so I said, “Oh, they’re actually just playing all of Shapes.” He said, “I wouldn’t mind that.” This is why I don’t make friends at rock concerts.